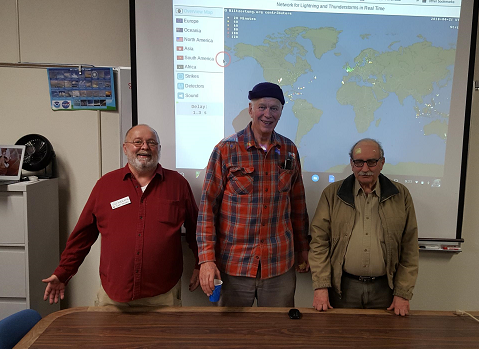 At our club meeting last Friday (April 20th), we had a trio of great presentations from club members, which kept the attention of all present! It was a great evening covering a variety of subjects, and included a rousing Q&A session from the audience. Jeff (AE6KS) kicked off a meeting with a presentation on his ADS-B receiver. This Raspberry-PI device captures aircraft beacon information and with software from Flight Radar 24 (https://www.flightradar24.com) allows you to see what your receiver can see! Pretty cool! Glen (KG0T) asked a simple question… “What is SWR”. The answer was a little more complex, subjective, and educational! Taking a different approach, Glen shared his thoughts, calculations, and experince on what parts of SWR were important to focus on when considering its impact on your station. Cap (KE6AFE) reminded us all that if the internet were to go down, with your radio, PC, and Winlink (https://winlink.org/ ), you can still have global email access! He recommends that everyone download Winlink Express (https://winlink.org/WinlinkExpress) and take advantage of the Forms that are included for emergency services and Radiogram messaging! Once you have downloaded it, send Cap an email! I would like to thank Jeff, Glen, and Cap for jumping in at the last minute to present when a scheduled presenter couldn’t attend. It shows the professionalism, strength and breadth of knowledge in our club! Also a big thanks to Becky (K16TKB) for coordinating these great presenters. Do you have an area of interest you would like to share? Contact the club Vice President, Becky KI6TKB. ‹ What does ARES say about Volcanos? !